As the internet has become the most important and most essential component in our day to day life, it has become so natural for us to expect everything online. And to provide us, the people of India with sophistication in applying for a passport, Indian Government has launched an online portal for Passport Seva Kendra. Passport Seva Online Portal is one of the initiatives started due to the rise in e-governance in India. Their service includes A to Z of most of the possible functionality in the passport office except the interview. I wonder what is not present in it for an online passport seva kendra portal. Indian Passport is issued by Indian Government. Without valid passport, you cannot travel out of India. The above picture is the screenshot of the welcome page of online Passport Seva website. You can see that there are four main coloured buttons in the left sidebar that are helpful for the most used services like the application of passport online and tracking the passport status in Passport Seva Kendra portal. Red is the link to register with the passport seva kendra website if you are a new user. Green is the link to passport seva kendra login if you have already registered and just need to login to your account. Purple is the link to track passport status in Indian passport seva kendra online portal. Yellow is the link to check for the availability to fix an appointment. 1. 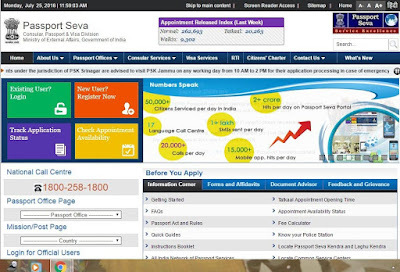 Visit Passport Seva Kendra Login Page - http://www.passportindia.gov.in/AppOnlineProject/user/userLogin. 2. Enter the Login id in the Login Id text field and click on login button. 3. You will be asked to enter your password and verification text for passport seva kendra login. 4. Click on login button to login to Passport seva online portal. Let us see how to check passport seva status in Indian passport sewa portal online. 3. Enter your file number in the file number field. File number can be found in the acknowledgement letter given in Passport seva kendra once you submit your passport application successfully. File number can be found on the top right corner of the acknowledgement letter easily. 4. Select your date of birth. 5. Click on 'Track Status button to track Indian Passport seva status online. There is a good news for the passport applicants. You can track the passport seva status easily. There is a premium SMS service available that will enable you to get regular updates on your mobile number. It is an optional value-added service application that the applicants can opt for a small charge. Currently, it is Rs.40 to enrol yourself to SMS Service of Passport. Please note that this fee is not part of your normal passport application fee. People who are enrolled to this premium SMS service option will receive alerts and updates of their passport application regularly. You will even receive alerts on pending actions through SMS service. You might receive up to 9 SMS alerts and updates on your application. The alerts will include alerting for documents submission, respond to notifications, collection of passport, exceptions or erros in processing at any stage, penalty and show cause notices. You will also receive updates on police verification and passport printing and dispatch details. People who are not enrolled for this service will continue to get important passport application status like sms sent after passport dispatch. How to enrol for Passport SMS service? If you are applying for passport directly in Passport Seva Kendra office, just select the 'SMS SERVICES' option in the application. Pay the enrolment fee in cash in Kendra. If you are applying for passport online or using uploaded e-form, login and go to the link 'Enrol for SMS services' available under 'Services' section. How to locate Passport Seva Kendra location? 2. Select the option 'Passport Office' or 'Pincode'. 3. If 'Passport office' is selected, you can see a drop down list of locations of passport offices from which you can select the location. If pin code option is selected, you have to enter the pin code of the desired location. 4. Click on 'Locate PSK/PSLK' button. There is an option to locate district passport cell too. There are several tabs at the top that consist of all the information required by the user. About Us column gives all the details about the history of passport and their current details. Passport offices tab provides the list of passport offices in our entire country and abroad. Consular services tab details the functionality of them on how well the Government is always ready to provide the people overseas any help they require. Visa Services column gives the entire detail about the types of visa present, their duration, eligibility, visa policy, basic principle and other such details. RTI is the next one which abbreviates as Right to Information. Whatever be our query, we can appeal and get to know all the information through this. All further processing are also linked into this. Citizens’ Charter tab is linked to a pdf embedded to it. That pdf document briefs about all the basic information that a citizen might want to know regarding a passport. Contact us tab has three separate sections which deviate to Passport, Visa Services, and Consular Services. By choosing on the need of the individual, we can click that and find the contact information. The last tab is the What’s New tab that gives the information on the latest notices and the updates, circulars, feedback from dignitary, awards and recognitions, case studies and such facts. There is a column “Before You Apply”, beneath that there are four segments which possess all the details a particular applicant will want to know before applying for a passport. Information Corner has the answers to how to get started, Frequently asked questions, Passport Act and their rules, Quick guides, Instructions, Passport services network throughout India, Tatkaal opening time for the appointment, availability option for fixing an appointment, fee calculator, to know the location of the passport office and service centers. Forms and Affidavits column has the link to download the e-form that can be filled and sent through online, Annexures/ Affidavits, Print application form and the undertaking as per GSR. Document Advisor tells the exact requirement of the documents to be produced in the interview for each category separately; for the fresh passport, for re-issue of passport, for PCC and other services and for the diplomatic/official passport. Feedback and Grievance will let us know about the way to access information and to log grievance, to check the grievance status and the information. Our Government has very well planned the online portal so that once we enter into it, we get to know everything we want and to finish our work in one go. The accessibility is excellent that even those who are completely new to working online will find it absolutely easy to utilise the service offered to us. Banglarbhumi gov in 8080 lrweb - How to use?